If you have conifers or other plants that seem to have grown weird, dangling pinecones, look again because you have bagworms. Bagworms have been hatching for the last week or so. You can find the tiny caterpillars with tiny upright bags anywhere there are bags left from last year. 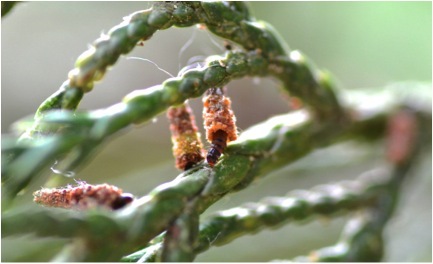 The Bagworm, Thyridopteryx ephemeraeformis, is a very common pest of conifers and other ornamental plants throughout the eastern United States. These pests overwinter as eggs within the mother’s bag. Larvae emerge from the bag during the May and June (depending on location and temperature). The larvae crawl or drift via silk strands to nearby foliage where they begin to feed. Bagworms are relatively sedentary during their lifetime, most often remaining on the same tree until they pupate. Adult females are wingless and never leave the tree. 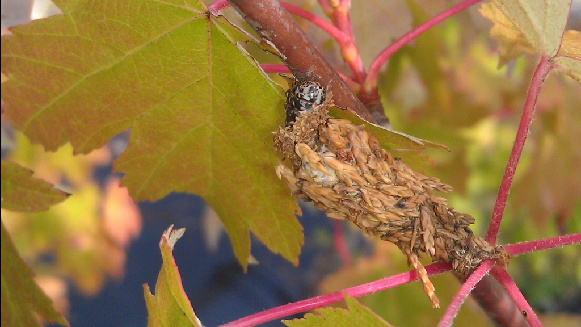 Male bagworms develop into a small brown moth. Bagworms feed on plant foliage and heavy infestations can defoliate trees and shrubs. Young caterpillars produce a silk bag on their posterior end that gradually collects plant debris. This creates a bag covered in pine needles or leaves that protects them from predators and looks (sort of) like a pinecone. Since they don’t move much as larvae and the females don’t fly, they can build up dense populations. Since they are so camouflaged and protected from insecticides, management of these insects can be difficult and time consuming. One of the most effective, yet time consuming methods of treatment are hand-picking or cutting the female pupae bags off of the branches. When this is impractical or impossible, there are chemical control options available that should be applied when caterpillars are young (now) because they are more vulnerable. As with many other pest insects, bagworms are susceptible to predation from parasitoids and birds which can also assist in their control. 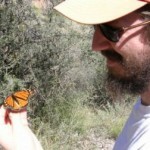 PhD student Adam Dale contributed to this post.